All transactions are safe and secure with a reliable history in online purchasing behind each of our associates. Buy the Milton's Red Swingline Stapler to own Office Space clothing and merchandise. 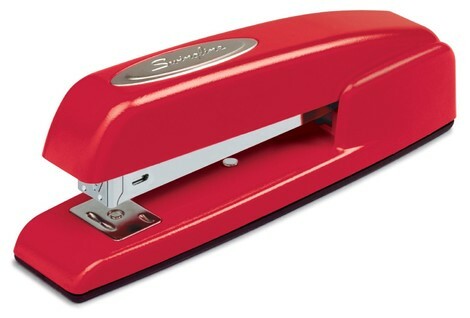 Staple your TPS reports together with a red Swingline stapler just like the one that belongs to Milton Waddams in the movie. It's the perfect gift for any fan since it's a bit of a gag gift that can also be used on a daily basis. If you decide to keep it for yourself, just be careful. Its classy red design might lure stapler thieves. In addition to the Milton's Red Swingline Stapler above, browse the Office Space Clothing Gallery for more apparel like men's and women's clothes, kids shirts or hoodies.